New apartment (renovated), views of the sea (100m). Property 3: New apartment (renovated), views of the sea (100m). Property 36: Apartment new residential area, 4 people, 2 steps from everything. Apartment in residence, ideal for cyclists, 200mt. from the sea. 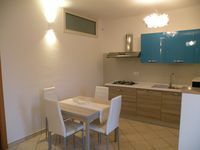 Property 45: Apartment in residence, ideal for cyclists, 200mt. from the sea. 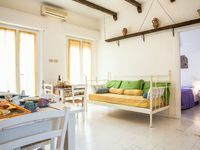 Wonderful apartments in the hart of Rimini. I have stayed there twice in two different apartments. One time on the second floor and one time on the fourth floor. The top apartment has a fantastic roof terrace. From there you look over Rimini and it made me think of Morocco. The apartments are very clean and comfortable. Everything you need is available. The owner, Massimo, is very friendly, hospitable and helpful. He speaks also English and French and gave us useful information about Rimini and surroundings. I consider Palazzo Antiche Porte as a top location for a fair rate.